Join me in the cold, dark, life-sustaining NE Pacific Ocean to discover the great beauty, mystery and fragility hidden there. Just another day on the sidewalk in front of my house. It’s Saturday morning. I open the curtains. And there they are – three sets of binoculars pointed in my direction. Again. It’s been like this for 2 months now**, leading neighbours to wonder what is going on and if I am okay. I am, thanks. I’m just peachy; not a feather out of place. In fact, I have a bird’s eye view of something simply wonderous from which I have learned a great deal. All the activity on my sidewalk – the binoculars; people coming from Kamloops, Calgary, Victoria, Vancouver and possibly further afield (with at least one person sleeping in his car till daylight so he could be the early bird) – it’s not about me at all. It’s about the birds. Against all odds, multiple species of really rare and exotic birds are here together in our little neighbourhood in Port McNeill. We’re not used to having this kind of “vagrant” in the ‘hood! It began in early December when, while on a conference call, I almost lost my mind when a brilliantly yellow coloured bird landed in the shrub in front of my home office window; near the feeder I leave out for the Anna’s Hummingbirds who spend the winter here. Winter range of Hooded Orioles marked in blue. Source: Cornell Lab of Ornithology – see this link for more information and a larger map. I scrambled for my camera uttering colourful nouns, thankfully having the sense to put the phone on mute. I got a picture. I don’t know much about birds and therefore did not trust my ID. Could it be a . . . could it really be . 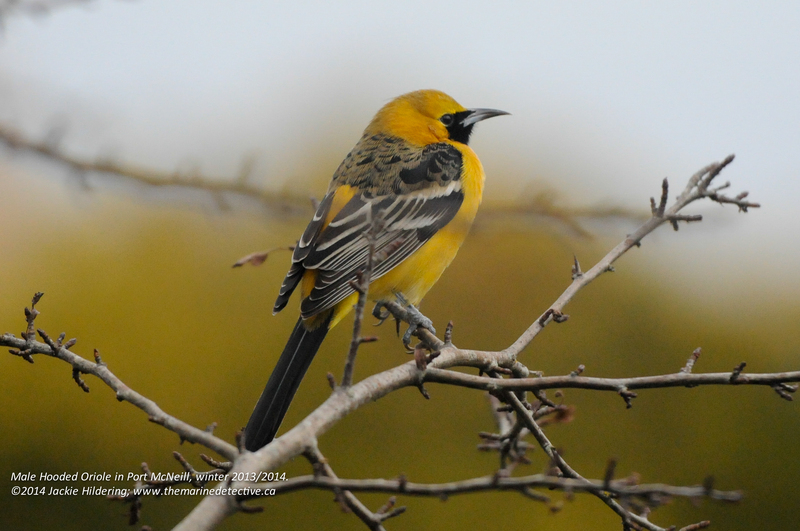 . . a male Hooded Oriole?! They are not supposed to be here. They should be in palm trees in the Baja in winter but I dared share the photo and my timid ID with those I know to be BC’s leading bird authorities. The responses came back pretty quickly. They confirmed how rare this sighting was. 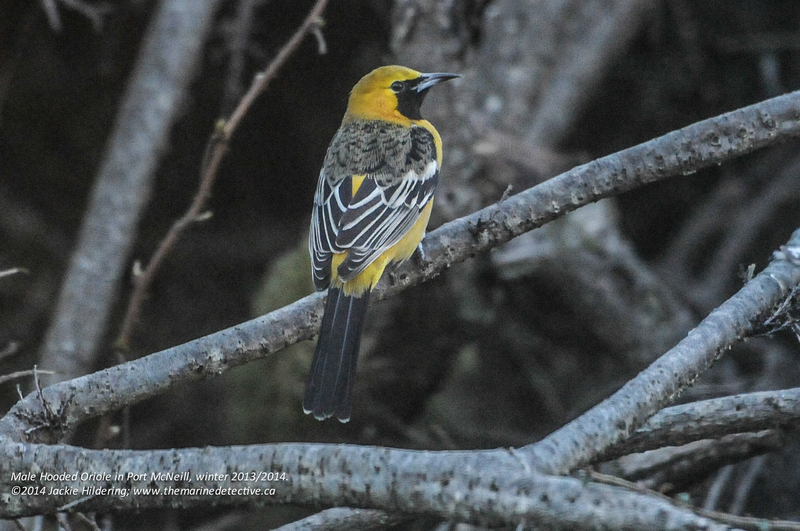 Apparently, there have only been two previous recorded cases of Hooded Orioles making it through a BC winter – in Terrace in 1998 and in Prince Rupert in 2007. I was determined to do all I could to give this one a fighting chance since the odds of him finding his way “home” were infinitely small. I slightly modified the hummingbird feeder. It appeared to meet his needs and he stayed. The word spread about how predictably such a rare bird could be sighted, and the birders started appearing. 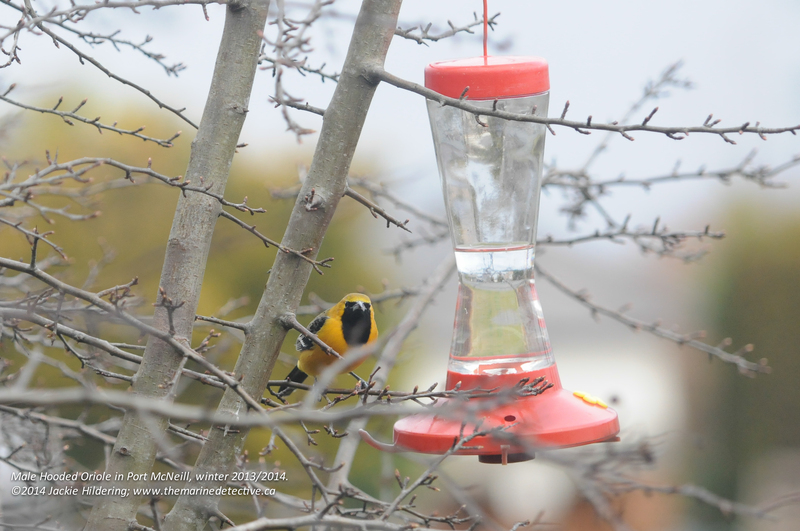 At first I was very worried about how the attention might disturb the Oriole (and me) but many could learn a thing or two from the nature viewing ethics of bird-watchers. Winter range of Dickcissels marked in blue. Source: Cornell Lab of Ornithology – see this link for more information and a larger map. They watch from a respectful distance, never setting foot on my property, truly wanting to witness natural behaviour. They rarely strive to get a photo to affirm their experience and certainly would not disturb the bird for the sake of getting the photo. They appear to “just” delight in seeing a rarity and being able to add a bird species to their list. Certainly there is no “get up and personal” – the phrase I loathe most in reference to wildlife viewing. Then, things got even more exotic. With all the birder expertise directed at the shrub with Mr. Oriole, a Harris’s Sparrow* was also spotted (winter range is the south central US), and a Yellow-Rumped Warbler (somewhat less noteworthy as this area is part of their summer range) and . 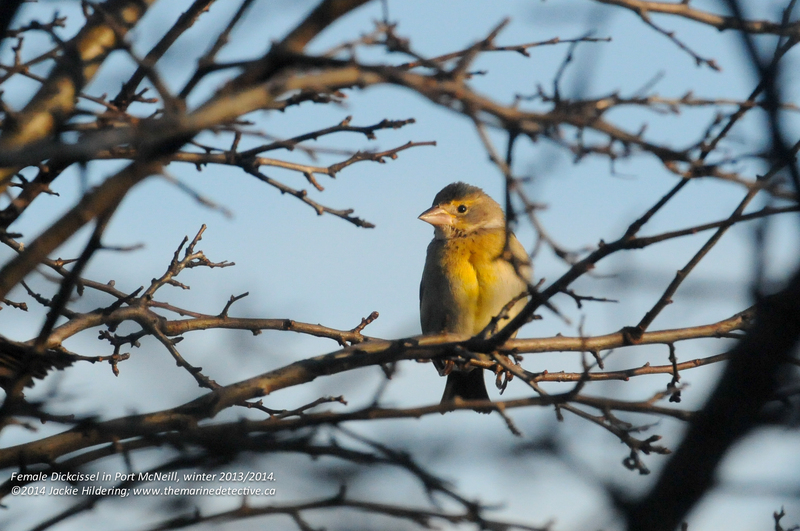 . . a female Dickcissel. 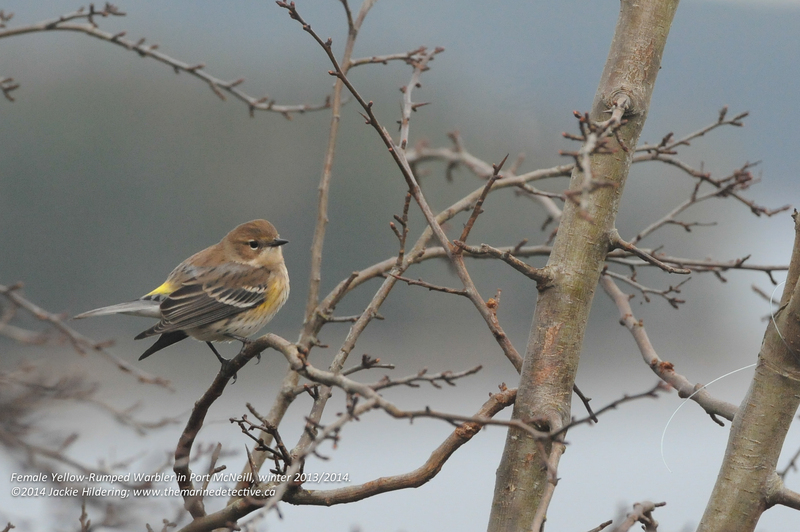 Yes, that’s right – a Dickcissel. I too had no idea such a species existed and certainly would not have been able to discern her from the House Sparrows she often hangs out with. 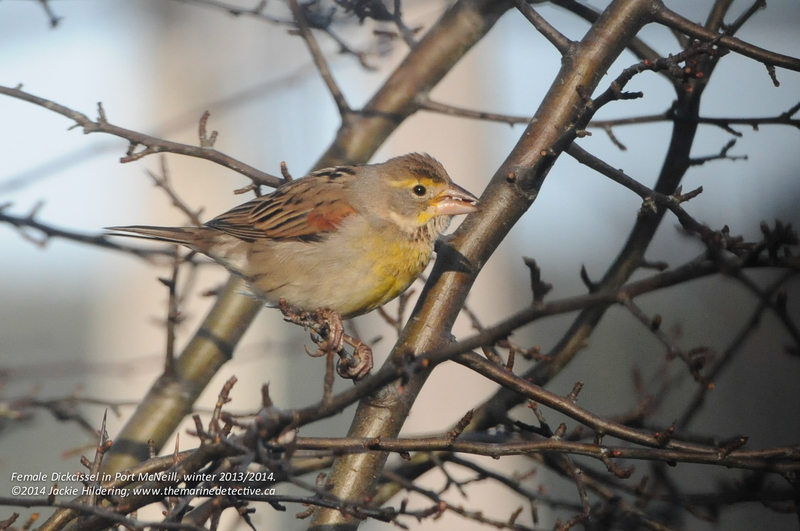 Neighbour Jim Nolan was the first to notice her, and teach me to spell “Dickcissel”! And how exotic is she? Her kind winters in Guatemala and Venezuela. Bring on more birders! And more binoculars on the sidewalk! And more neighbours wondering what on earth was going on. Bird watchers reference this phenomenon as the “Patagonia Picnic Table Effect”. One rare bird attracts birders, who then find another rare bird, which brings in more birders . . . and so on! In this case it is the “Port McNeill Shrub in Front of My House Effect” and how grateful I am for privilege of a front row seat to the birds, and the birders. They have made me reflect more on human behavior and expectations while viewing wild animals. I have become even more attuned to how extraordinary the wildlife of our area is and how, if you are especially watchful and respectful, the reward can be so great. Clearly, the idiom “birds of a feather flock together” has also been challenged and I am greatly comforted that one rare bird can find another! Not surprisingly, the birds have further heightened my wonder in Nature and, frankly, in life as well. Why that shrub? Why our neighbourhood in Port McNeill? Random chance? Ideal conditions? I will add this to the many things I will never know for sure. What I will also allow myself to believe is that the appearance of the birds is evidence that colourful, rare and exotic beings can find my front door! *I never saw the Harris’s Sparrow and have not heard of repeat sightings of this individual from birders. Note that all photos were taken through the front windows of my home. See end of blog for range maps for Yellow-Rumped Warblers and Harris’s Sparrows. 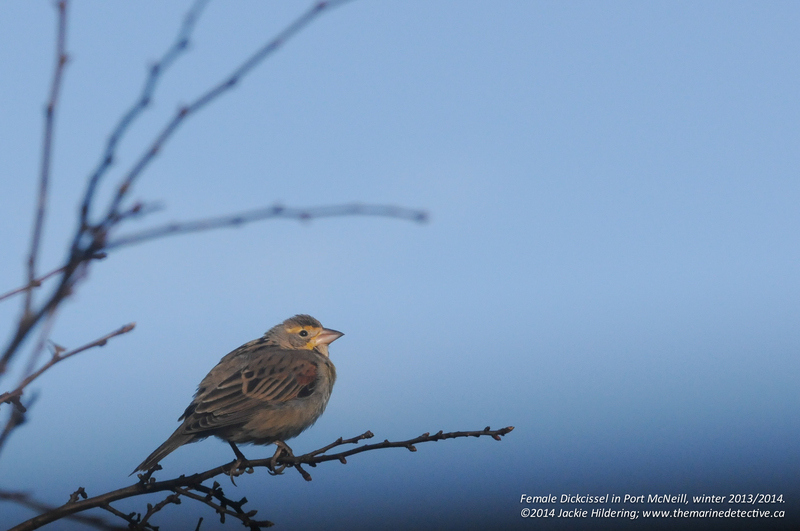 ** Update April 6, 2014: The female Dickcissel is still a daily visitor. 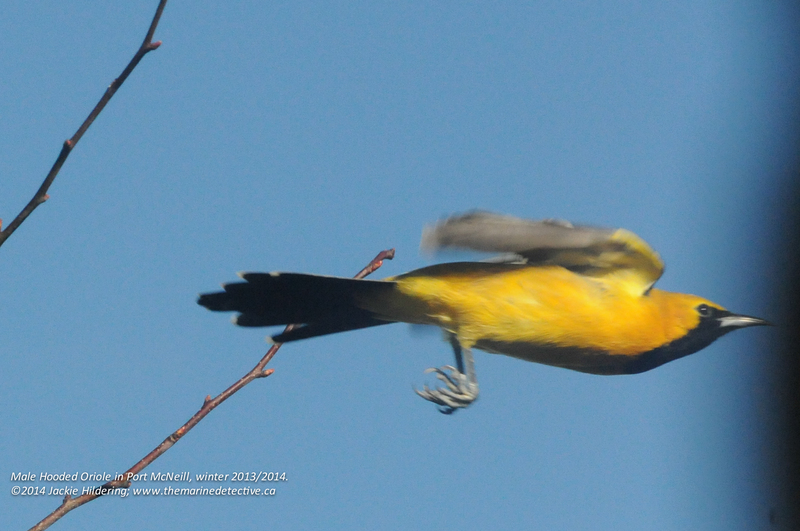 My last sighting of Mr. Hooded Oriole was March 29th. Presumably, he has moved on to new adventures, striving to join with his own kind and find a mate. Winter range of Harris’s Sparrows marked in blue. Source: Cornell Lab of Ornithology – see this link for more information and a larger map. Winter range of Yellow-Rumped Warblers marked in blue. Source: Cornell Lab of Ornithology – see this link for more information and a larger map. Attack of the Sea Slugs! Why are these wonderful, exotic, beautiful species residing outside YOUR window?? I think it is your karma! One beautiful rare species deserves another! What an incredibly sweet and generous thing to say (type) dear Fran! Thank you. Jackie, are you getting these photos off the internet and claiming them as yours? Ha ha. Really though, the whole scenario is unusual. 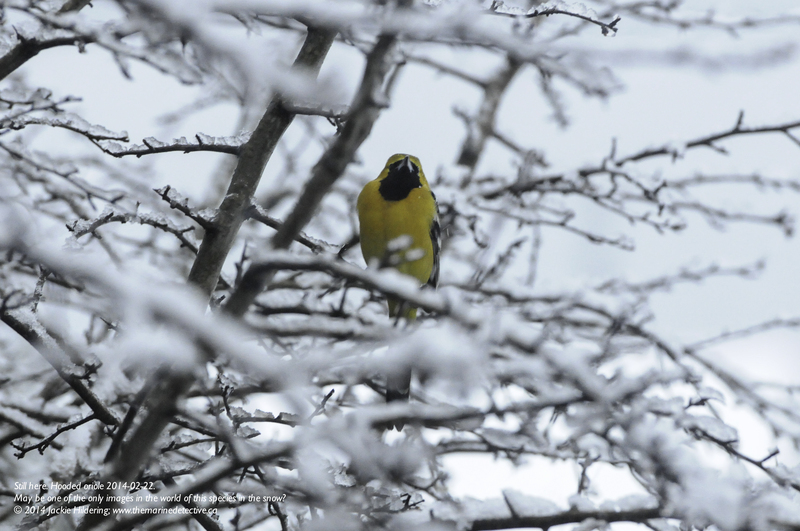 All these exotic species showing up at your house…and the birds, too. We hope to see many more in the near future, Do you take requests? Now, now Peter! Claiming exotic species status, putting in requests, AND “dissing” my respectful, from-behind-the-windows photography? Bird envy will get you nowhere! My experience with the birders was similar to yours. Their quiet excitement and gratitude was contagious. I was glad to have helped, even a little bit. Curtis aside, you bring out what’s best about our community and area in your articles. Port McNeill is lucky to have you. At least one rare bird has taken up permanent residence and I for one am glad of that. Great article Jackie. Jim, knowing the source, this means a very, very great deal to me. Thank you so much. Wonderful how the birds have better connected us. those seem to be the same kind of birds i see out MY window in SAN DIEGO, CA these days! 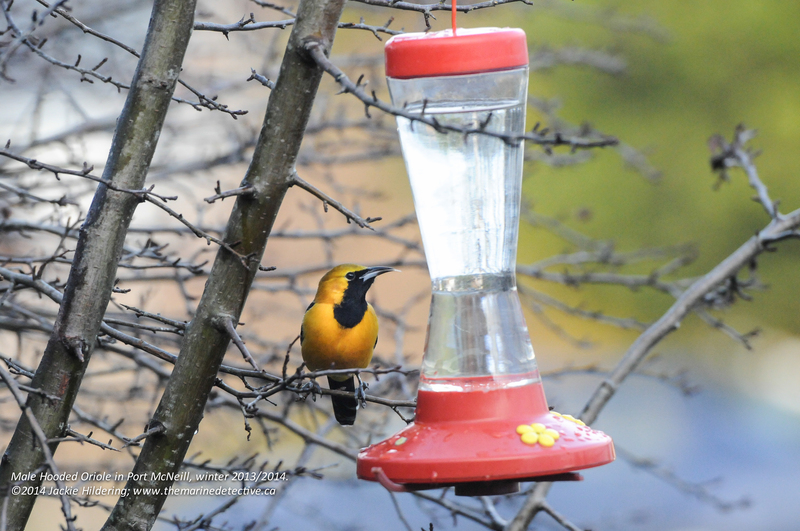 I think your male hooded oriole is here, i have one looking exactly like your pic! i’ve named him mr. bibb. not an expert here, just a gardener who likes birds esp hummingbirds! glad i came by your site!